Lippert among the flock in Kero, Imbongu district, southern highlands province. AFTER earthquakes and tribal violence in Papua New Guinea’s Highlands, 270,000 people need immediate life-saving assistance, almost half of them children, while security remains “unpredictable”, according to a United Nations report. “Access to clean water, food, sanitation, nutrition and health services remain immediate concerns,” a report by the UN’s child relief agency, UNICEF, said. UNICEF has grave concerns for the long-term mental and physical health of children. An earthquake on February 26, followed by aftershocks, claimed 125 lives in some of PNG’s remotest highland areas. As international aid agencies, including Caritas Australia and Church partners, began delivering food and medicines, fighting broke out in Hela province, in which at least seven people died, and urgent aid efforts had to be suspended. Warring tribes signed a peace agreement on May 4 but UNICEF still rates security as “unpredictable”. 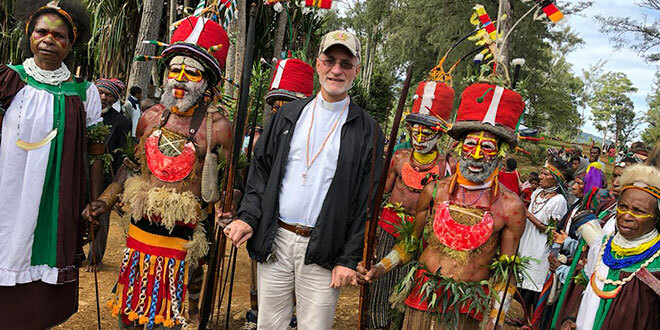 As violence raged in late March, Bishop Lippert, a Capuchin, posted on social media about brutal gang attacks on schools in which armed men hunted for “enemy” students to kill, and burned down school buildings. The UNICEF report describes urgent, ongoing concerns, especially for the protection of children. “The earthquake and subsequent unsettling aftershocks have caused significant fear, a sense of uncertainty and the disruption of social and educational services in SHP (southern highlands) and Hela provinces, a region already suffering from years of violent group conflicts, domestic violence and gender-based violence,” the report said. “This complex emergency is having a profound negative impact on the mental health of children, including on brain development and their overall long-term well-being. “UNICEF aims to provide 15,000 affected children with psychosocial support, 3000 children in need of protection with access to case management and referral services, and (about) 33,000 children and adults with information on prevention of violence against children. The report also predicts children under five are at risk of acute malnutrition.